I recently downloaded around a 1000 Arcinfo Ascii Grid files and wanted to import them into Grass GIS. My first thoughts were to use the 'r.in.gdal' module wxGUI (of course) but this wouldn't allow me to import all the files in one go. Then i tried the 'r.in.arc' module but again this only seemed to want one file at a time. Thanks to Markus Neteler for this solution...The 'GDALWARP' utility!. Step 1. 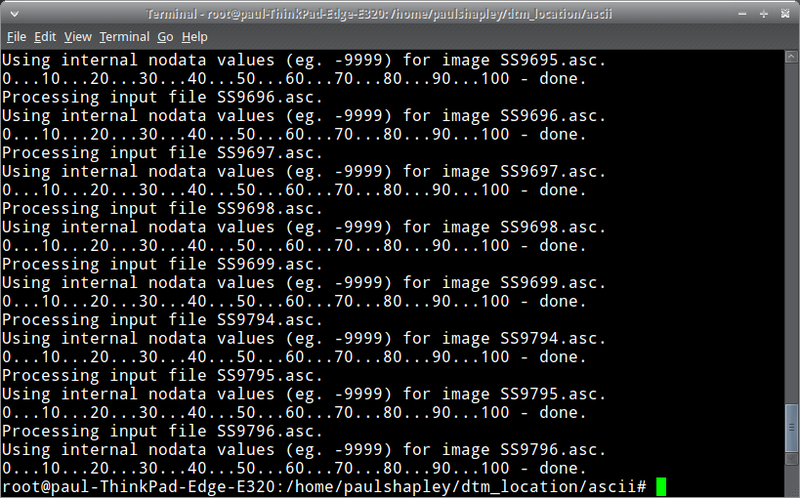 In the command line navigate to the folder containing your '*.asc' files. 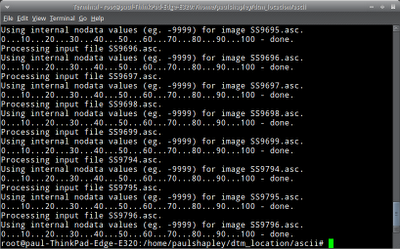 The processing of each file should follow this format on the command line as above. Job Done. An image entitled 'mosaic.tif' will have been created in the same directory. Step 3. Simply import the 'mosaic.tif' into Grass GIS. Apply your own colour table as necessary.